Spanish police on Monday cleared away taxis that blocked a main avenue in the capital of Madrid, the latest action in a weeklong standoff with authorities over the growth of app-based ride-hailing services that cab drivers say threaten their livelihood. The local and national police forces said there were no significant clashes and that nobody was arrested, despite some scenes of tension witnessed by reporters. The striking Spanish taxi drivers want the regional government in Madrid to impose tighter regulations for rides hailed through apps like Uber and Cabify. They demand similar steps like those announced for Barcelona, where local authorities can now modify regulations to require app-based rides to be hired up to one hour in advance. Uber and Cabify have reacted by threatening to drop their operations in Spain's second-largest city, where they say 3,500 jobs would be at risk. Self-employed drivers working for the two platforms are also occupying parts of Barcelona's main thoroughfares on Monday to urge the regional Catalan government to halt the new regulations. In September, Spain's government gave ride-hailing companies four years to comply with regulation granting them just one new licence for every 30 taxi licences. Authorities have rejected any compromises that would wipe out competition for the taxis, which are regulated as a public service. 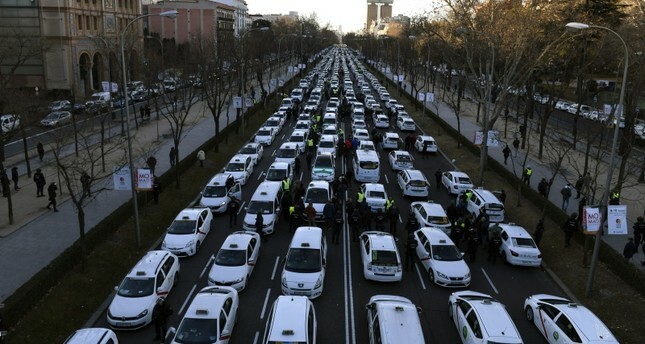 Taxi drivers in the capital moved their protest over the weekend from the city outskirts to Castellana Avenue, in Madrid's central north-south axis. Traffic was at a standstill early Monday, when many residents commute to work, until police unblocked the main thoroughfare. The drivers, many of them wearing the yellow vests that have become common in protests in France, moved on foot to protest at the headquarters of the conservative party ruling the Madrid region.